Website address withheld so that this awful place does not benefit from any traffic from this site. It really came out looking like this. The Bravissimo Cafe and Pizzeria's website proclaimed, "The Ferrara tradition continues." While this may be a fact, I must, in good conscience, state publicly and for the record that this was not a good thing. It all started last week when I walked past the window of this joint and saw a sign advertising the following. I was foolish not to assume that "Bravissimo" meant anything other than over-priced, incompetent, and bland--I was naive, and I wanted to believe....but I have skipped ahead a bit. Happy Meal and I decided to minimize the risk at the outset of this ill-fated adventure. He ordered a slice of pizza, and I ordered the World's Greatest Burger. From there it all just went terribly, terribly wrong. Issue 1--The counter staff was clueless as to what went into the burger, where the bun came from, etc. This was not her fault. The blame for this was all on the management for forcing an employee to be incompetent. Issue 2--Happy Meal received and finished his slice before my burger ever left the griddle. 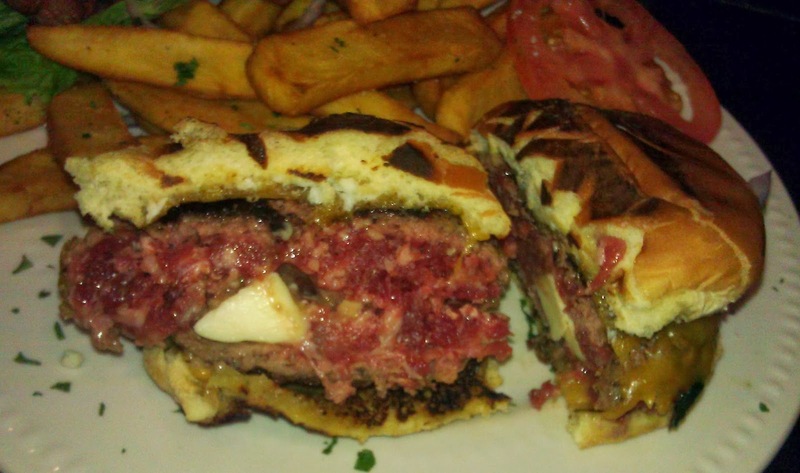 Issue 3--The burger that I ordered Med-Well arrived DEAD RAW after an 18-minute wait. Issue 4--The second attempt was Medium. I just gave up and went with that version. 30 minutes was long enough to wait for what was clearly destined to be inadequate chow. Issue 5--The fries from the first attempt were re-cooked and used for the second attempt, so they were bleak and dry. 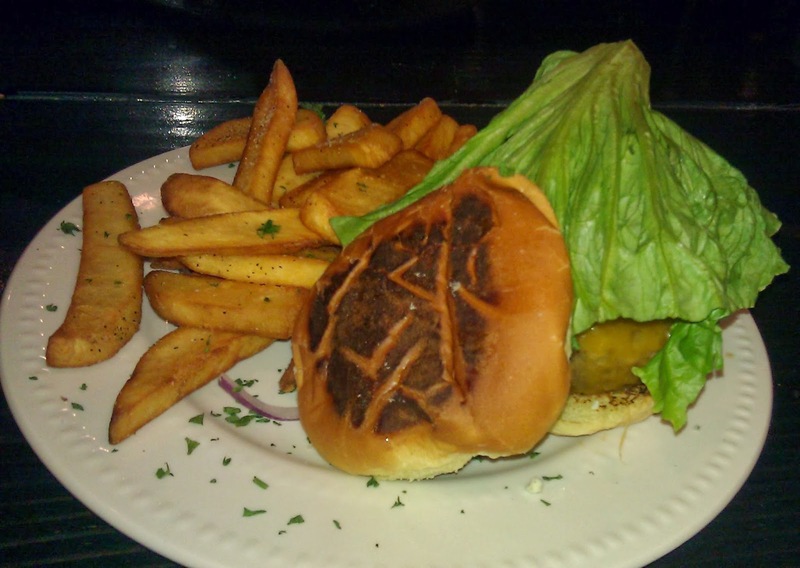 Issue 6--The Romaine lettuce on the burger was limp and dead. Issue 7--The top of the bun was scorched. Issue 8--The bacon on the burger was cool to the touch. Issue 9--The burger patty was charred. These things were all clear before I took a single bite from this burger. The Beef: The menu claimed that the Chuck was ground fresh daily--neat. The 8-ounce meatball was bland--as bland as water. The beef was oily to the point of giving Happy Meal and myself stomach aches from the 4 ounces that we each consumed. The only flavor evident was char, and bitter is not the sort of flavor that a burger should lead with, let alone be the only notable flavor. The Seasoning: There was NONE. The kitchen at Bravissimo Cafe and Pizzeria failed to use any seasonings in the ground Chuck or on the surface of the comically bland patty to add any flavor. Now, the raw patty, that I sent back, was full of all manner of mystery items (see scary photo). The Medium patty, that I ate, contained none of those ingredients. I am uncertain if I dodged a bullet or missed out on something awesome due to the incompetence and the inconsistency of the kitchen staff. 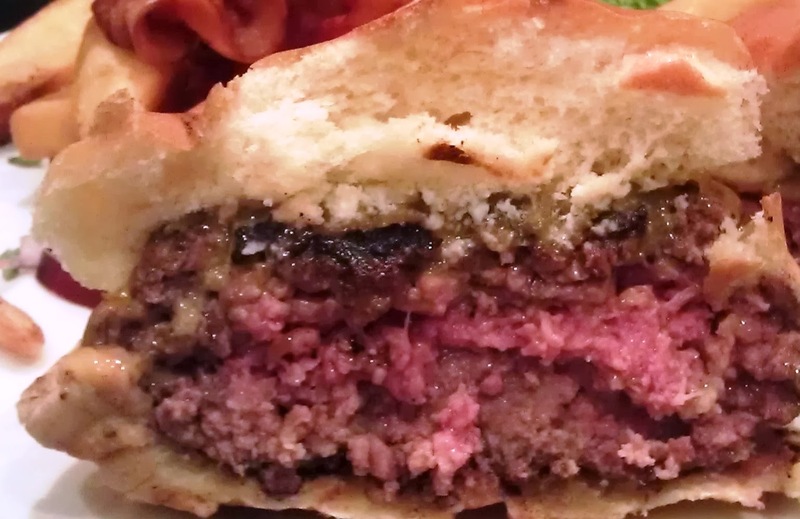 The Sear: There was a charred patch at the bottom of my burger patty--does that count? The Preparation: Haphazard, shoddy, careless, diffident, weak, poor--these are all words that come to mind. The Cheese: The cheeseburger at Bravissimo Cafe and Pizzeria came with a little bland Cheddar and a dash of Bleu cheese, but these cheeses were lost in the bland, greasy, charred sphere of weakness that compressed the bun like a sweaty, sumo wrestler on a down pillow. 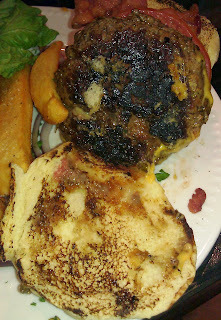 The Bun: Aside from being charred on the outside, the bun was only nominally toasted on the inner surfaces. It seemed that 30 minutes was too short a time to properly toast a burger bun. The bun itself was soft and fresh. It was also very bland. The Meat To Bun Ratio: The bland, oily wad of burned Chuck overpowered, soaked through, and flattened the bland, scorched bun at Bravissimo Cafe and Pizzeria. The Toppings: More of the same. The bacon was cool to the touch. The "caramelized"onions promised on the menu--not so much. The slivers of raw, red onion were scattered under the assembled burger--huh? The Romaine lettuce leaf was wilted and sad. The Fries: The over-cooked, peel-off, steak fries were scorched, bitter, and dry. They were barely seasoned. 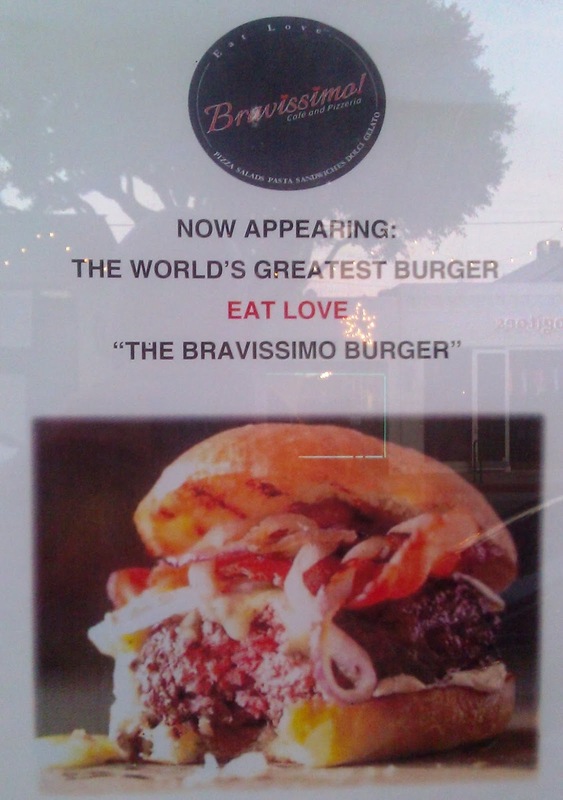 The Value: Bravissimo Cafe and Pizzeria appeared to be in the One And Done business of bilking tourists with $12 burgers. There was clearly no interest in repeat customers. Not once did the counter staff check in to see if the burger was satisfactory. I assumed this was because they were keenly aware that they were serving up crap, and they didn't need for me to confirm this. Happy Meal put it best, "That's what you get for ordering a burger at a pizza place, Dad." 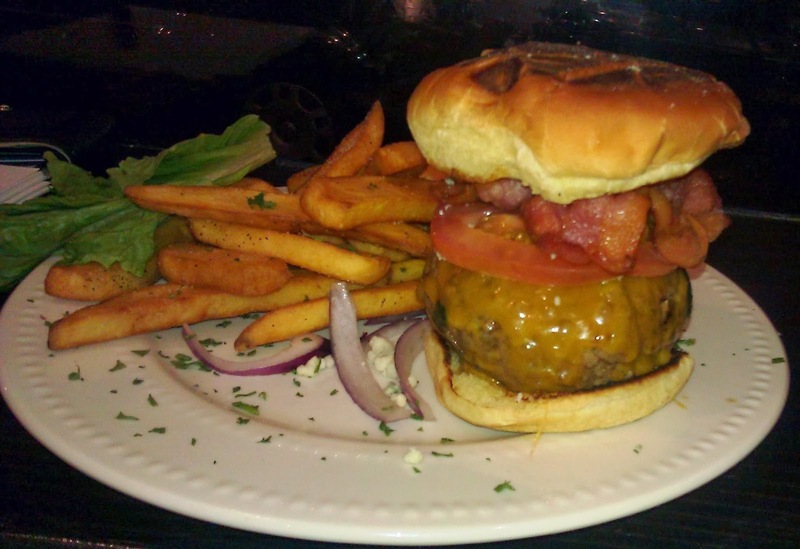 Burger Review : Bravissimo Cafe and Pizzeria served up a shoddy, over-priced, bland cheeseburger. Terrible, just terrible. I walked in hungry. I walked out with a stomach ache. This adventure was a complete waste of time and 20 bucks. . . . . lost in the bland, greasy, charred sphere of weakness that compressed the bun like a sweaty, sumo wrestler on a down pillow. hahahahahah................... I think I read that quote in a Shakespeare play in high school; how dare you plagiarize! I had to look up the word 'diffident'. how was Happy Meal's pizza? Paul, Happy Meal enjoyed the pizza, but I can't take him back there to support that business. Even after a 30+ minute wait for terrible food, they still charged him 5 bucks for a cannoli--lousy service, lousy burger, steep prices...I will not give them any more of my money. I could go for some churrascaria food. I've been on a serious weight cut to get down to 5% body next month...I am hungry, brother. hope you had a nice Christmas pete . . . .